Make Eleven Plus Exam Preparation Fun! What skills are necessary for success in selective tests such as the 11 plus exams? 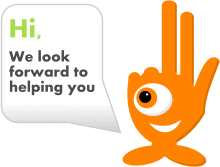 A recent article in New Scientist states that “Working memory training could be the key to unlocking brain power”. The games and activities you can play with our cards are designed to practise all of these skills and more. The games are enjoyed by the whole family. Great to take on car journeys – games can be played anywhere. Children never complain about playing games – when they are tired of practice papers the games will revitalise their interest. The cards are designed so that many different games can be played with each pack. On top of exercising the mind, you’ll also have lots of FUN! This pack of playing cards was specially designed as a fun way to enhance your word skills. The cards combine elements of scrabble, rummy and countdown and are great as part of 11+ preparation. 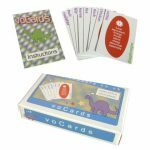 Each card contains a letter, which can be used to play word games, and a list of 5 carefully selected words designed to enhance your creativity, vocabulary and memory skills. Each card has a partner card with synonyms (words of similar meaning – synonym questions appear frequently in the 11+ exam). The pack comes with rules for lots of games and we have found that people like to invent their own games too. Although these cards were designed for 11+ preparation, they are great fun for all ages. Many of the games can be made more challenging if so desired. Here is the most simple game you can play with alphaCards. Please not that alpaCards are not just cards with letters on. Each card contains carefully chosen words which can be used to improve vocabulary. There are many more complex games that you can play with these cards. This video shows a simple game that improves alphabet speed. It will be almost impossible to beat the World Record in this video. A pack of playing cards specially designed as a fun way to enhance your vocabulary and creativity. 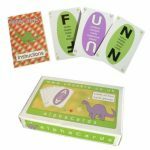 Some of the games played with this pack involve learning to quickly recognise groups of words as you would in the 11+ exams and others involve using your imagination to create your own conversations and stories. The cards include the types of words that commonly appear in 11+ exams. 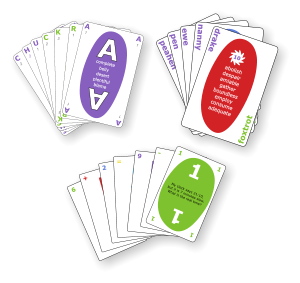 Each card has a partner card with antonyms (words of opposite meaning – antonym questions appear frequently in the 11+ exam) Instructions for many games are included and we have found that people also enjoy creating their own. 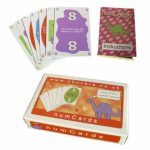 This pack of cards is designed as a fun way to improve number skills commonly needed for the 11+ verbal reasoning and maths exams. The cards contain a mixture of 11+ questions or 11+ related questions(ie knowledge of dates, times, tables etc.). Not only are these games great for 11+ preparation, they are enjoyed by adults too. By slightly adjusting the rules, the games can range from easy, to very challenging, to impossible! Rules are included and you’ll also have fun making up your own games using the cards. All my children have now passed!